Monday, January 16, 2012, 6 p.m. The Ottawa Board of Health met in the Champlain Room, 110 Laurier Avenue West, Ottawa, on January 16, 2012 beginning at 6:00 p.m. The Chair, Diane Holmes, presided over the meeting. The Ottawa Council on Smoking and Health received a Smoke-Free Champion award and presented postcards to Chair Holmes. All members were present with the exception of Members Richer and Hutchinson. 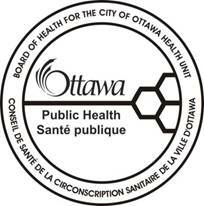 That the Board of Health for the City of Ottawa Health Unit confirm Member Holmes as its Chair and Member Kapur as its Vice-Chair for 2012, to be confirmed at the first meeting of each year of its term as required by the Health Protection and Promotion Act. Members Richer and Hutchinson advised that they would be absent from the Board meeting of January 16, 2012. The Minutes of the meeting of November 21, 2011 were confirmed. The seven communications items listed in Appendix A were received. Staff were directed to examine a report from the Middlesex-London Health Unit Board of Health entitled “Nutritious Food Basket Costing Survey Results For 2011 And The Opportunities For Action” and report back on the recommendations as part of a report to be tabled in Q2 of 2012. This report is the third item in Appendix A. That the Confirmation of Chair and Vice-Chair report; Medical Officer of Health’s verbal report; the Interim Report on Ottawa Public Health’s Response to the Community Infection Control Lapse; Cancer in Ottawa 2012 report; Morbidity and Mortality in Ottawa 2012 report; Strategic Priorities 2011-2014: Link to Operational Activities, 2012 report; and the Attendance at the Association of Local Public Health Agencies (alPHa) 2012 Winter Symposium report be received and considered. That the Board of Health for the City of Ottawa Health Unit receive this report for information. · Develop policies for 100% extraordinary provincial funding to Ontario public health units to allay the costs associated with such events. · Encourage the CPSO to continue its out-of-hospital inspection program and consider increasing the frequency of inspections. · The CPSO consider a strategy for its membership with respect to enhanced training and general awareness of infection control procedures. That the Board of Health for the City of Ottawa Health Unit receive the Cancer in Ottawa 2012 report and the accompanying Cancer in Ottawa 2012: Knowledge to Action Report for information. That the Board of Health for the City of Ottawa Health Unit receive the Morbidity and Mortality in Ottawa 2012 report for information. 2. Direct staff to provide this report to the City Manager’s Office of the City of Ottawa to ensure Council is made aware of Board priorities and how they align to the City's. That the Board of Health for the City of Ottawa Health Unit approve the attendance of Chair Holmes and Member Harder at the Association of Local Public Health Agencies’ (alPHa) Winter Symposium, to be held February 9-10, 2012 in Toronto. That the Confirmation of Chair and Vice-Chair report; Medical Officer of Health’s verbal report; the Interim Report on Ottawa Public Health’s Response to the Community Infection Control Lapse; Cancer in Ottawa 2012 report; Morbidity and Mortality in Ottawa 2012 report; Strategic Priorities 2011-2014: Link to Operational Activities, 2012 report; and the Attendance at the Association of Local Public Health Agencies (alPHa) 2012 Winter Symposium report be received and adopted as amended. That the motion in item 9 be amended to strike out the wording “immediate coverage from OHIP to ensure” where it occurs in the resolution. Therefore be it resolved that the Board of Health for the City of Ottawa Health Unit send a letter, to the Minister of Health and Long-Term Care, on behalf of the Ottawa Board of Health, advocating that new immigrants who have tested positive for latent tuberculosis infection, be able to receive immediate coverage from OHIP to ensure timely and effective treatment to prevent the development of active tuberculosis disease. A by-law of the Board of Health for the City of Ottawa Health Unit to confirm the proceedings of the Ottawa Board of Health at its meeting of January 16, 2012. No information was previously distributed. The Board adjourned the meeting at 7:45 p.m.